business cards | A wife, a baby, a mortgage, and a startup. So yeah, neither of us are graphic artists – that’s for sure. When we needed to come up with a logo for some business cards from Moo, well, that fell on my shoulders (since I have a legit, real, honest copy of Illustrator – thanks former life in academia). What we came up with is so not a logo. It’s kinda just a font, with some color, but it’ll do for now. So a version of it now lives up there, in the upper right. That’s us, TempMine. Neat. Our biz cards look ok, not great. Amusingly enough, I apparently messed up the color, so they’re a little darker, and purpleyer. Whatevers. There are first, and they’re kinda cool. 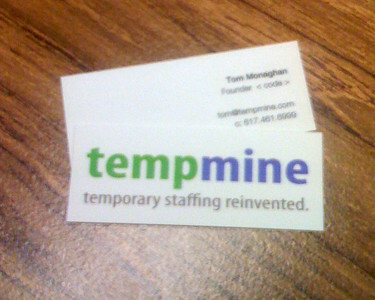 Take away: Don’t waste too much time or money on your first biz cards. If you pay more than $25 shipped, you’re wasting cash better used on anything else. Also, don’t get too into the logo yet. We’ll have way more time to worry about that later. This entry was posted in starting the startup, Uncategorized and tagged business cards, design, logo, marketing on May 26, 2009 by Tom.